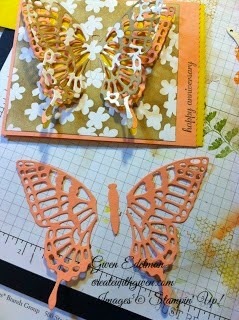 A special butterfly for a special couple. 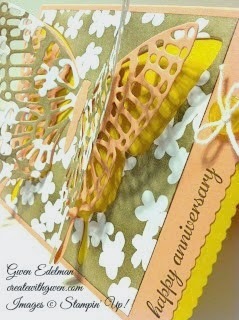 I try not to make an anniversary card too girly, so I hope this works. Using one of the patterns from the Irresistibly Yours Specialty Designer Series Paper (FREE Sale-a-bration product), I sponged with Soft Suede ink all over and then rubbed off with a used dryer sheet (or a paper towel). The ink will not color the embellished pattern! It's the "Emboss Resist" Technique basically done for ya! -Card base-Calypso Coral is 4 1/4" x 5 1/2" then cut off 1/4" with Rotary Cutting Blade on the Stampin Trimmer to make the finished size 4 1/4" x 5 1/4". -Irresistibly Yours Specialty Designer Series Paper is 4" x 4 1/4", sponged with Soft Suede Classic Ink Pad. -Open base and align DSP in front side of base,to the left and center as to create a top, left side and bottom border. 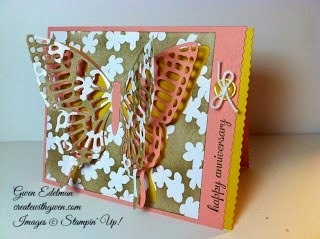 -Die cut large Butterfly through both DSP and card stock for exact placement. I ran it through the Big Shot a few times and both butterflies came out nicely. -Remove both butterflies and adhere the DSP on top of the Calypso Coral card stock lining up the negative butterfly images. -Adhere the DSP butterfly back into it's negative space only attaching the middle body part so the wings "flutter". -Cut the Calypso Coral butterfly as shown. Attach the middle body part on top of the DSP butterfly and only attach the inside edge of the wings under the DSP butterfly, so it's wings can also flutter! -Open the card and adhere a 4 1/8" x 5 1/4" piece of Crushed Curry card stock to the underside of the front of the card, covering up the butterfly "hole". -Stamp and embellish your way! I used a Crushed Curry button from Best Year Ever (Free Sale-a-bration item) and a piece of white Bakers Twine. Let me know watch ya think! Picking a random comment to receive this Double Butterfly in the mail!